Sleaford CC Second XI fell to South Lincs and Border League defeat by five wickets at Spalding on Saturday. The hosts won the toss and fielded, but after Aayush Patel was caught by Jonathan Miles (2 for 23) off the bowling of Roy Tilley (4 for 44) for nine, captain Kurt Colyn and Simon Godby put on a very productive partnership. Godby was caught by Ambrose off Joseph Bloomfield for 32 before Colyn went for a very good 53. Spalding then took control and only Kieron Harbron (18) contributed as Sleaford were restricted 143-8 from their 45 overs. In reply, Spalding batted consistently through Jon Manton (39), Bloomfield (29) and Miles (29). Harbron took two wickets, with one apiece for Goddard, Wormington and Godby, but Spalding were comfortable winners in the 44th over. On Saturday, Sleaford host Stamford at London Road (1pm start). * The Third XI also travelled to Spalding, winning the toss and fielding first. Peter Cook fell early to Jake Henderson, and Max Lorimer (4 for 55) bowled Ollie Dring (13) and Jack Sawyer (12), but the whole Spalding innings revolved around Carl Andrews. Coming in at four, he batted through the rest of the innings for a splendid unbeaten 156 with support from Lewis Collishaw (22) and Mark Sawyer (10) as Spalding posted 240-9 in their 45 overs. In reply Jake Henderson was run out for a promising 44, but Macey Andrews took 5 for 30 as Sleaford were 150 all out in the 40th over. On Saturday, Sleaford travel to Frieston. * Sleaford CC’s Sunday Second XI, sponsored by Turnbulls, were involved in a very competitive game against a strong Hartsholme team. 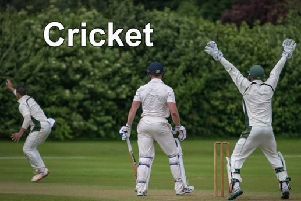 The hosts batted first and made 194 all out in the 39 overs, with Ian Shorthouse taking 4 for 35 and Matthew Appleyard and Aayush Patel taking two wickets each. Simon Godby compiled an excellent 65, supported by Patel (27) as Sleaford chased well. Shorthouse also made a very solid 27 not out, but the visitors fell just short with 178-8 at the close. This weekend, the Sunday First XI host Revesby at London Road (1.30pm start). * Sleaford CC U11s, sponsored by Brauncewell Quarries, hosted unbeaten Woodhall Spa at the London Road ground on Tuesday evening. After winning the toss, Sleaford batted on a good wicket, but started slowly with openers Abigail Hannan and George Hix struggling to score against accurate bowling. When Hix fell, Oliver Sneath joined Hannan and their partnership gained momentum, adding 51 in just seven overs. Sneath (21 retired not out) scored quickly with a succession of boundaries through the covers as Hannan batted sensibly through the innings to finish 13 not out as Sleaford posted 65-1 from their 16 overs. Woodhall’s batsmen chased the target aggressively and looked on course to reach their target with ease. But tight bowling, particularly by Emmeline Hannan and Cayden Leader, coupled with two superb run-outs from Hannan and Leader saw the reply stutter. Yet Woodhall’s scored steadily to reach their target with four overs left. The pick of Sleaford’s bowlers was Evie Jarvis with 1 for 9 from two overs. * On Thursday, the U15s, sponsored by NFH Consultancy, hosted Bracebridge Heath. Sleaford batted first and started well through openers Jake Henderson (6) and Andrew Green (8). Jacob Cavaney was run out for 11, and Ben Glendinning top-scored with 13. Aiden Smith added five, helping Connor Panton to 10 not out as Sleaford made 72-5 off their 16 overs. In reply, William Fraser-Cattanach (4) was bowled by Aiden Rose (3 for 37) who also dismissed Pierce Hudson (1). However, Harry Humphreys (25) held the innings together before he was run out by Henderson. Henry Everett contributed a solid 10 and Nikith Nagaraj and William Davies made five each to take Bracebridge to 76-6 in the 11th over. Glendinning took two catches and Chris Jackson 2 for 15.